This morning, I ate churros and chocolate for breakfast. 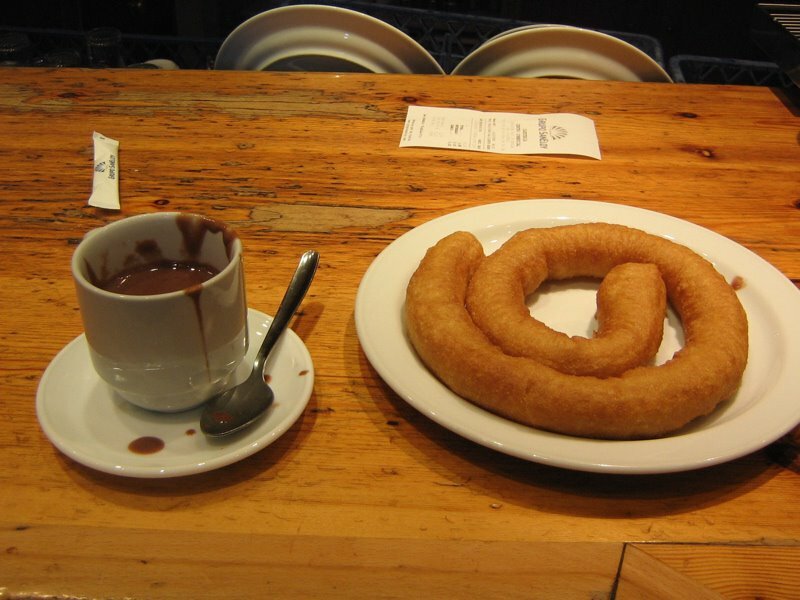 Churros and chocolate is a typical Spanish treat. You get a cup of hot (riding the line between pudding and liquid) chocolate and this greasy fried dough, or donut sticks. You dip the donut into the chocolate, then tip the donut back a little bit so that the chocolate runs down the interior of the donut, then pop it in your mouth. This morntng, I had a fresh fresh fresh churrro that was thick and circular. It was better than the ones that I ate in Madrid. Sadly, I couldn’t savor the yummyness because I had to make the train by 11:30. It was necessary to see the cathedral and the Arenal before I left. I hurried to the cathedral and, again, it was closed. However, I spotted a fellow walk in one of the side entrances, so I scurried over there, looked both ways, and felt like batman as I jumped through the thick brown mat covering the door on the side entrance. The cathedral was impressive and blah balh blha, here’s a picture. Interestingly, the priests were praying and singing in this old Gregorian style, and the organ played too. IT was nice because there were very few people were there. Next, I walked across the plaza to the Arenal, a palace/garden/special place that has many layers of significant history. Clearly much of it was constructed during Islamic rule because you could see it in the architecture. I’m sure there’s mountains of history here, but I didn’t have the time to get deeply into it. Now I’m on the train to Grenada. On Thursday, I will go to Alhambra,an Islamic fortress from the 9th century. People say it’s amazing. I hope it doesn’t rain.